If you have a sense of humour and you spend a portion of your week online you’ve probably come across The Oatmeal. It’s a spectacularly satirical, occasionally crass, always entertaining website featuring comics drawn by Matthew Inman. All I know about Inman is what I’ve read on The Oatmeal, from which I have taken the liberty to presume him smart, funny, devil-may-care and somewhat philanthropic. He also appears to be bullish when it comes to matters that are important to him, and it’s this last bit that brings us to the point: the digital realm is a dangerous place in which to wage war. Inman’s work is, unsurprisingly copyrighted, he even has a little note next to the copyright beseeching people, “Please don’t steal”. Despite this, a website called FunnyJunk grabbed a bunch of them without permission and proceeded to make money from them. By all accounts, Inman tried to be tactful and diplomatic and asked them to remove his content. But to no avail. It gets convoluted but it all came to a head when Inman published a blog post about the ongoing saga, FJ took offence, FJ fans took offence and FJ sued Inman for $20 000 – for damages, apparently. Take away the legalities of it all. Forget who has the moral high ground. Take justice right out of the equation. Let’s look at why it was such a large error of judgement. 1) The Oatmeal has a cult following. FunnyJunk might have fans, but cult followers outweigh mere fans by a significant margin, especially when it comes to banding together and making a noise. 2) The Oatmeal’s cult following is not small; Inman has dedicated and vociferous fans all over the world. 3) There was no way a man with Inman’s [presumed] qualities would ever take something like that lying down. He was always going to respond in a very scathing and very public manner. He published the papers he was served, complete with his own rebuttals and then stated his unequivocal intention to tap into his following and the net at large to raise $20 000, half of which he would donate to the National Wildlife Federation and half to the American Cancer Society. But first, he vowed to photograph the money and sent it to FJ’s owner, Charles Carreon, along with a picture of Carreon’s mother seducing a bear. The picture is there and it’s not pretty. As one would expect, Carreon took this badly. He emailed his site’s members telling them that Inman was on a quest to shut them, blah blah, blah. Inman kept up his crusade on The Oatmeal; not really doing himself any legal favours with comments that could be serious contenders for defamation. He was merciless; every response earning him more fans and raising more money, meanwhile every counter-response from Carreon took its toll on his and FunnyJunk’s reputation. Well, the matter is still ongoing, but here’s the current situation, as far as I can tell. Inman raised over $220 000, which he is adamant will be divided between his charities. He has also taken a picture of money (his and not the money raised, due to legal issues related to the fact below). Meanwhile, Carreon has also sued the website that hosted Inman’s charity drive and is trying to stop the money from reaching its intended destinations. The legal complications abound. The red tape is amazing. Now, I don’t know what will happen. I don’t know who will be vindicated. 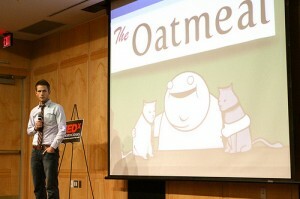 I do know that whatever happens, The Oatmeal will have won over the public. I am confident that FJ will lose members, customers and money. I am also confident that future generations will learn about FJ’s folly in lessons on how not to go about settling legal disputes online. Wars should always be conducted in private because you never know what the fallout will be. You might think you’re infallible, but you could be in for a nasty shock. Never take on someone who can draw your mother in compromising positions with a bear. Learn when to accept defeat gracefully. Never back down when you feel you have been done in. Don’t be afraid to go public with what you know. Use your following to your advantage – even a small following can make a difference if they really believe in you. These days, reputations are won and lost online. Many more people may now know about FJ than they did before the saga, but they won’t have positive connotations. And despite what you may have heard, there definitely is such a thing as bad publicity.